Welcome to Consult and Challenge! We are a co-production group working primarily within the boundaries of Southampton City, in order to build equal working relationships between Service Users and service providers. We engage and work with those public servants tasked with the healthy and effective running of the city. Our distinctive diversity and friendly, yet focussed attitude, provides an effective platform to work from. We all have different backgrounds and experiences, and champion the idea that people are all ‘experts by experience’. 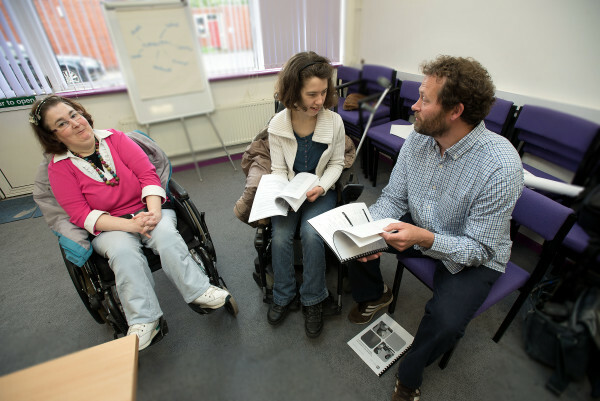 We are based at SPECTRUM Centre for Independent Living and generally meet once a month. Some of the things we have worked on recently include designing a permission to share form as a simple way for Service Users to communicate health and social care needs to the right people. The form means that the Service User chooses who does and doesn’t have access to their confidential information. We have also worked with the local Clinical Commissioning Group to develop a Service User friendly website. We are always looking for new members who are looking for new challenges and want to make a real difference. So if you like the idea of what we are doing and want to get involved please get in touch. When do you have your Consult & Challenge meetings? Full member Consult & Challenge meetings occur on the 3rd Wednesday of each month. Smaller sub-group meetings are arranged by the sub-group members themselves. *If you do park on the road, a fully mobile person can easily move a vehicle to an adjacent road during the 10 minute, mid-meeting break, and still have time to get a cup of tea! Who can join Consult & Challenge? Membership is predominantly for Southampton residents, and those who access the city’s Health and Social Care services, however in certain cases Hampshire residents are accepted onto the group’s membership. We also have representation on the membership from both Southampton City Council and Southampton Clinical Commissioning Group. Yes. All reasonable travel costs are paid. For more details please speak to the facilitator.